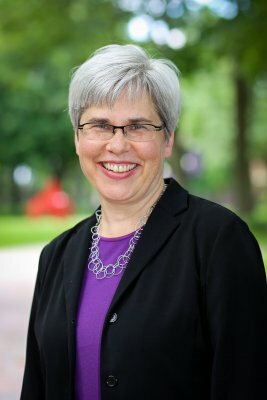 President Rebecca J. Stoltzfus became the 18th president of Goshen College in 2017. A 1983 Goshen College graduate, President Stoltzfus was vice provost for undergraduate education and professor of human nutrition at Cornell University before returning to lead her alma mater. President Stoltzfus studied chemistry at Goshen College and received master’s and doctoral degrees in human nutrition from Cornell University. Before joining the Cornell faculty in 2002, she taught human nutrition at the Johns Hopkins Bloomberg School of Public Health (Baltimore, Maryland) — the top-ranked school of public health in the United States. As a vice provost at Cornell, President Stoltzfus oversaw initiatives designed to enhance undergraduate instruction and campus efforts to support inclusivity and academic success for all 14,000-plus undergraduate students. She was part of the leadership team of Engaged Cornell, a university-wide public engagement initiative. She was assistant and associate professor of human nutrition at the Johns Hopkins Bloomberg School of Public Health (Baltimore, Maryland) from 1992 to 2002, prior to joining the faculty of nutritional sciences at Cornell University in 2002. As a professor, President Stoltzfus collaborated to create Cornell’s Global Health Program, which offers community-engaged learning opportunities for undergraduate students working on global health issues with partners in Tanzania, Zambia, the Dominican Republic and in two sites in India. The programs are based on reciprocity and partnership, and have generated innovative models for educating Cornell students and local students as partners in service projects, research and policy case studies. President Stoltzfus’ research focuses on the causes and consequences of malnutrition in women and children in low-income countries, especially the integration of direct nutrition interventions with intersectoral strategies such as infectious disease control, food safety and reproductive health. She has over 150 peer-reviewed scientific publications, with collaborative research projects ongoing in Zimbabwe, Tanzania and India. She has been a member of the National Academy of Sciences Food and Nutrition Board, associate editor of the Journal of Nutrition, president of the Society for International Nutrition Research, member of the National Academy of Sciences Forum on Investing in Young Children Globally and is a fellow of the International Union of Nutritional Sciences. She has served as a member of two World Health Organization’s Expert Advisory Panels, for Nutrition and Parasitology, and is a recipient of several awards from the American Society for Nutrition for excellence in international nutrition research. President Stoltzfus is married to Kevin W. Miller, a 1985 Goshen College graduate with bachelor’s degrees in biology and nursing, and a master’s degree in public health from The Johns Hopkins Bloomberg School of Public Health. He has worked as a nurse, a public health practitioner, a community health researcher and a church administrator. They are parents of two young adults, Lydia ’18 and Gabe Miller ’20. Her parents are alums Victor and Marie Stoltzfus of Goshen, and her father was president of Goshen College from 1984 to 1996. Singing, cooking and hiking are among President Stoltzfus’ hobbies. Read more Goshen College news about President Stoltzfus.